What is a shed stain? Shed stain products fall into several key categories, all of which will stain the shed timbers and offer some sort of protection for the shed. Varnish type wood stains that are suitable for a range of exterior wood care projects including window frames, exterior wooden doors, log cabins and garden sheds. High end exterior wood stain systems usually comprise of a stain for changing the colour of the wood then a varnish top coat. The top coat is designed to wear with weathering over time and is topped up with a fresh coat of varnish after a number of years stipulated by the manufacturer. It’s important that these products are maintained when the wear layer starts to look dull or looses its lustre. Leaving it too long before maintaining can result in water penetrating beneith the top coat, eventually resulting in cracking, splitting and peeling. If this happens the finish will have to be sanded back to bare wood and re-applied. Maintening the finish as and when required will prevent this from happening. High quality wood stain systems include Sadolin and Sikkens. Using a wood preserver to give garden sheds the best possible protection makes good sense. Although wood preservers are available in clear formulations, they are also available in various colours and shades of black, green and brown. For example ‘Holly Green’, ‘Cedar Red’, ‘Summer Tan’, light and dark brown. These preservers both stain and protect the timber from mould, algae and insect attack. It is better to overcoat a wood preservative with a clear oil or varnish rather than using them as a standalone product. Find out more about coloured shed preservers here. As with wood preservers, wood oils are also a dual purpose product. Usually containing a blend of oils, waxes and resins and available in both clear and coloured formulations, these exterior wood oils provide excellent protection from weather and water ingress and are great as a semi-translucent or opaque shed stain. Find more about coloured wood oils suitable for sheds here. Those of a certain age will remember when anything made of wood in the garden used to be treated with Creosote. The sale of Creosote is now regulated and can only be sold to farmers and for for other industrial uses. The good news is that there is a safer more environmentally version called ‘Creocote’. This oil based Creosote substitute is perfect for use on garden fences and sheds. Shed paints are a bit of an oddity as many products sold as garden paints suitable for wooden sheds are in fact wood stains. Confused? It’s not that complicated. Find out more about garden wood and shed paints here. 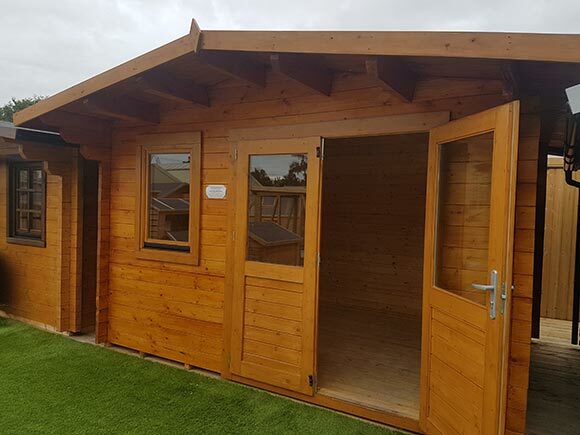 Ensuring that sheds are kept free from mould, algae and other biological growth will not only help to keep a shed looking good for longer, it will also help to prolong its life. Treating a shed with a mould and mildew cleaner prior to preserving, staining or painting will ensure that any mould or algae spores already in the wood will be killed off prior to treating. This will help to prevent mould and algae from forming in the months after the shed has been built and before a wood preservative, oil, shed paint or stain can be applied.